April 18, Cayuga County, NY – The 2016 Finger Lakes Sweet Treat Trail brochure is now available at the Cayuga County Office of Tourism. This popular trail promotes locally grown and produced sweet treats and was voted one of the Best Food Trails by Readers of USA TODAY and 10Best. 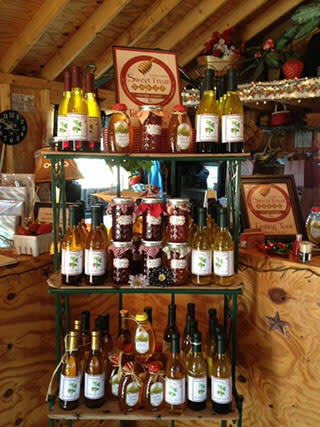 The 2016 trail includes twenty-one stops where you can enjoy locally grown and made sweet delights ranging from fruit wines to maple syrup to jams and jellies. Visit Muzzi’s D’Italia Ice in Weedsport for their Italian Ice made with fresh fruits from the farmer’s market and Dorie’s Bakery in Aurora for house-baked scones, muffins and breads using locally produced flour, fruit and syrups whenever possible. The new Bradford Heights Delights Marketplace in the Fingerlakes Mall features specialty items from local producers including baked goods, maple syrup and Finger Lakes Coffee Roasters coffee and Treleaven Wines in King Ferry is not to be missed for their delicious dessert wines made with grapes from their vineyard. You can also visit the Auburn Farmers Co-op Market from June to October for locally grown fruits plus jams, jellies, baked goods, honeys and syrups. From North to South in Cayuga County it seems like all roads lead to yummy goodness! The 2016 Finger Lakes Sweet Treat Trail will officially kick-off on May 6th from 5 – 8 pm at Theater Mack @ the Cayuga Museum, Auburn as part of First Friday, a community open house coordinated by the Auburn Downtown BID. This farmer’s market style event is free and family-friendly, offering samples and tastings of locally produced baked goods, jams & jellies, honey and maple syrup from most of the 21 sweet spots on the Trail. The 2016 Finger Lakes Sweet Treat Trail Brochure & Pass to all of the participating sites will be available for pick up so you can start planning your own personal sweet treat tour! Receive a FREE Sweet Treat Trail tote bag or button with a purchase at any of the trail stops and enter to win a Sweet Treat Trail goody basket after you have visited eight stops. This year the Trail will be open May 6th to November 26th, covering three seasons of sweet treat goodies from tasty strawberries in June to crisp local apples through November.